Welcome to W Nodes Funeral Directors in Barnet. We continually strive to set the highest standards for funeral care across London and Hertfordshire. We understand that kindness and integrity can go a long way during this difficult time, which is why we will listen to your thoughts and wishes attentively, treating you as if you were a member of our own family. We have served families over the last century with the same quality of care that we are renowned for today. Your best interests are at the heart of all we do, so you can trust us to take care of every detail with complete sensitivity to your needs and wishes. Our Barnet funeral home is centrally located on the high street and is easily accessible from all of our surrounding areas. 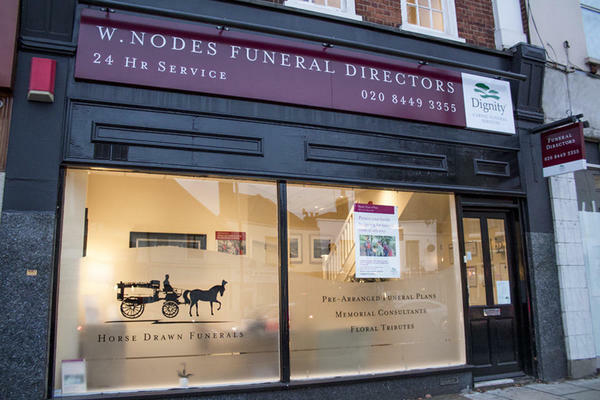 You can also find W Nodes funeral homes in Wood Green, Southgate and Crouch End. Call us today on 020 8449 3355 to talk through your personal requirements. There is pay & display parking off the high street, and a large paid car park at the Red Lion pub. When travelling down High Street from St John the Baptist's Church, we are in the row of shops before the Red Lion pub. Our staff are available 24 hours a day on 020 8449 3355 if you require our services outside of these hours.